In the early-1950s the Mormon Church taught its missionaries a particular method for effective proselytizing. 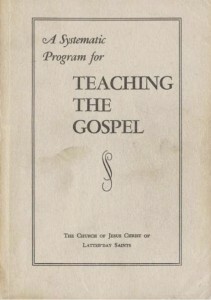 The book, A Systematic Program for Teaching the Gospel was published and distributed by the LDS Church as detailed instruction for missionaries. I was recently reading Lesson 1, “The Godhead,” and was struck by how the Mormon Church’s missionary approach has changed over the years. In 1955 the first missionary lesson focused on two very specific points: God the Father has a body of flesh and bones plus spirit; and the investigator’s church (and all “churches of the world”) teach a false concept of God. 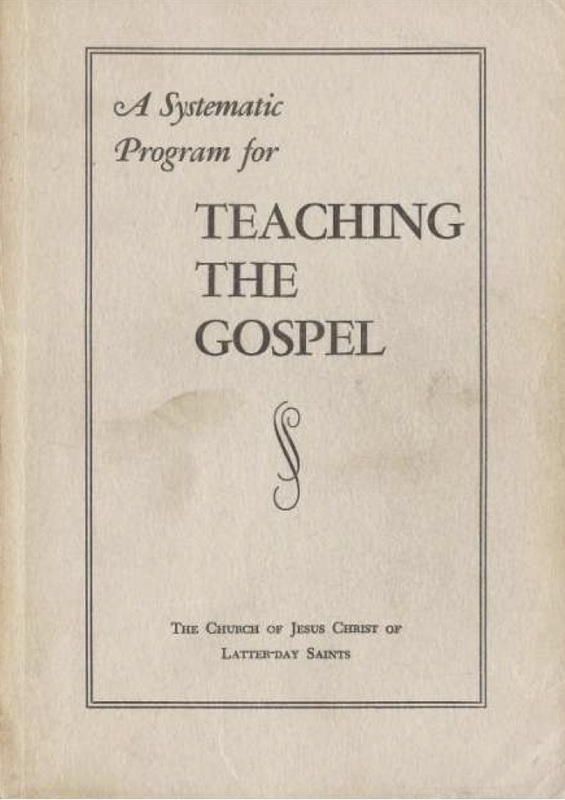 Eight years later the Mormon Church revised its systematic missionary approach and published A Uniform System for Teaching Investigators (1961). Then came The Uniform System for Teaching Families (1973) and Uniform System for Teaching the Gospel (1986). 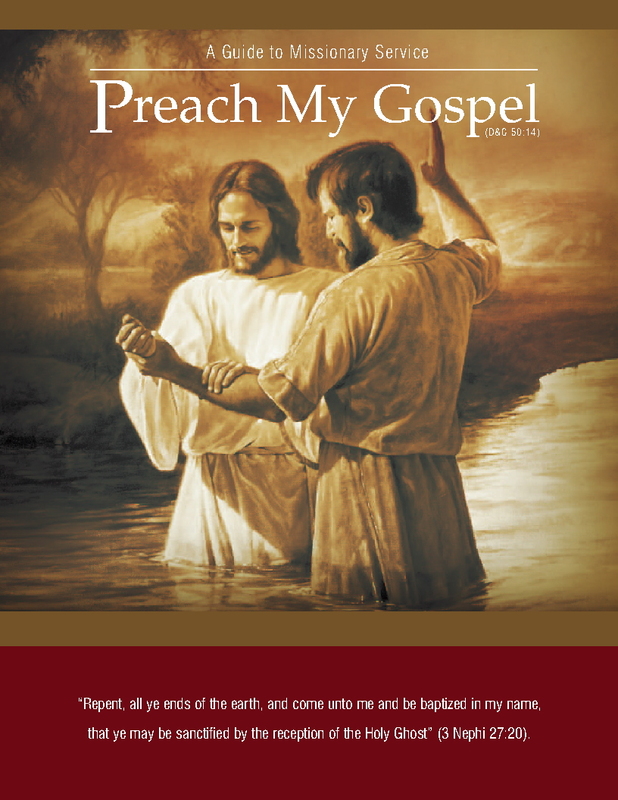 Finally, in 2004 the current missionary guide, Preach My Gospel, became the standard approach. Though I’ve not read them all, it’s my understanding that all of the LDS missionary presentations eventually provide the same set of doctrinal points; they’re just presented in a different order and with different emphases. As I already pointed out, the first lesson of the 1952 approach focuses almost entirely on God having a body and the Mormon assertion that all non-Mormon churches are teaching a false concept of God. Unlike the first lessons from later missionary guides, this lesson doesn’t even mention the Book of Mormon, Christ’s ministry, the atonement, or the plan of salvation. In the first lesson (discussion) from the 1986 approach, the Mormon doctrine of God having a body of flesh and bones isn’t taught at all. The concept is introduced in the second lesson as if it were established fact. Also missing from the first lesson in this missionary guide is the idea that other churches are wrong. The first lesson mentions Joseph Smith’s confusion about religion, and that various churches in 1820 seemed to have “great differences” in their teachings, but it’s not until the third lesson that investigators learn that God the Father and Jesus Christ “told Joseph not to join any of the churches because the churches were teaching incorrect doctrines” (3-8). In the first lesson of the 2004 Preach My Gospel manual, the Mormon doctrine that God the Father has a body of flesh and bones is again front and center (though it is absent from the corresponding pamphlet intended as a study guide for missionaries to leave with investigators following the first lesson). Apostasy, restoration, and the Book of Mormon also figure prominently in this presentation. In the 1952 lesson investigators learn that all churches are wrong, but the 2004 lesson goes a step beyond this when it also declares, “all their creeds were an abomination” (37). The 1952 presentation concludes with an invitation to attend the Mormon Church on the following Sunday, read some literature the missionaries provide, and “get on your knees this evening and pray to the God of whom we have spoken, not to a mystic spirit, but to our Father in Heaven” asking to know the truth of the things the missionaries taught (60). The 1986 lesson concludes by asking for a commitment from the investigator to “pray and ask our Heavenly Father whether the Book of Mormon is true and whether Joseph Smith was a prophet of God” (1-19), as well as an invitation to consider baptism, and a commitment to meet with the missionaries again. The 2004 manual concludes the first lesson suggesting that the investigator ask God “to know that the message of the Book of Mormon is true…Knowing that the Book of Mormon is true leads to a knowledge that Joseph Smith was called as a prophet and that the gospel was restored through him” (39). Missionaries are told to issue an invitation for baptism (40), while investigators are also asked to attend church with the missionaries on the following Sunday, set a time for the missionaries’ next teaching visit, and commit to keep any commandments the missionaries have taught them (41). While all of these first lessons from the various Mormon missionary presentations differ in which doctrines they teach, one thing is pretty consistent across all three: they all include the story of Joseph Smith’s First Vision. The Mormon approach to proselytizing is considerably different from Christian evangelism. Generally speaking, Christian missionaries immediately point people to Jesus. Of first importance of the gospel message is that Jesus died for our sins, just as the Scripture says; He was buried, and raised on the third day, just as the Scripture says; then He appeared to many, confirming beyond any doubt that He had risen from the dead and was fully able to fulfill His promise to reconcile His people to Holy God. As for me, I think I’ll stick with the apostle Paul and his instructions for evangelism. This entry was posted in Friendship, Interaction, and Evangelism, LDS Church, Mormon Missionaries and tagged Church of Jesus Christ of Latter-day Saints, Evangelism, LDS Church, Missionaries, Mormon Church, Mormon Missionaries, proselytizing. Bookmark the permalink. WOW! Many of my favorite topics all in one article. Mike R. sent me a little pamphlet a few years ago which was an analysis of the sales techniques that are used in the missionary lessons. What it amounts to is the MM engaging the prospect’s emotions and selling the program based on an (emotional) response. A series of leading questions are also used to get the prospect to “agree” with certain propositions. It’s salesmanship 101. Most of these MM kids can’t really go very deep and if a prospect goes beyond the second level of questioning, they are lost as what to do or say. They are counting on two things. One of these things is the before mentioned emotional hook. The second thing is the ignorance of the prospect concerning basic Christian doctrine. Lastly, if the MM boys do their job, they’ve identified prospects who may be in an emotionally vulnerable time in their lives and need some pat answers to complex problems. At the LDS training center, the trainees are also taught to evade and answer the question the prospect “should have asked” instead of the one they did ask. In sales it’s called the “judo” move. Here is a short video from the LDS training center with Bob Millet teaching the youngsters how to evade a question. Notice how he sets this up as basically a hostile situation with the questioner. In her article Sharon compares/contrasts the presentation that LDS missionaries use with what I was exposed to as a young Christian years ago. Campus Crusade had a little booklet that could be used as an aide to present the Gospel message of Jesus Christ. The difference quite clearly, is that Christians are showing that Jesus is the pathway to the Father. 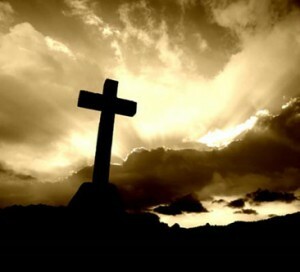 Jesus is the focal point. In Mormonism as practiced by the LDS sect, the presentation is all about the LDS church and it’s system for making someone a god. Now the MM aren’t that up front because if they were no one would sign up for their program. Here is what the Gospel is as presented in the four spiritual laws. The Mormon Missionary proselytizing methods , as revealed in their manuals , stands in sharp contrast to how Christian missionaries preach the gospel of salvation to the lost for Jesus . Mormons must tell people that there was a complete apostasy thus all churches are false and they preach a perverted gospel which cannot save anyone . This message is presented with carefully chosen words and together with a friendly demeanor it sells well — unfortunately . With Mormons it is about a new prophet and a church , with true Christians it is all about Jesus . The gospel is not about joining a religious organization for salvation , it is about sinful man being reconciled to God by the blood of Jesus — His dying for us on the cross to pay the penalty we deserved . Mormon Missionary lessons are laced with using emotion as a means to prove the claims made by the Missionaries being true . While it does seem that this tactic has been toned down in number somewhat in recent decades , it still is the mainstay in the salesmanship used by Mormon Missionaries to gain converts . When we consider how strange some of the doctrines that Mormon leaders have preached are , it goes without saying that Mormons must try and convince a potential convert to trust in their feelings / emotions to validate Mormon leaders as trustworthy religious men to follow . But that is a potentially spiritually dangerous venture . see Acts 17:11 . The apostle John recommended the primary way any new prophet is to be evaluated — 1 Jn 4:1 . That is still a valid criteria to use today because of Matt 24:11 . Let’s face it. Mormonism is a tough sell. The reason is that the sale goes lost once people get inside the sect. The LDS sect is a high commitment type of organization and there is a limited set of people who would care to join and stay. That’s why the drop out rate and the number of inactive members is so high. You’re looking at a two-thirds to one-third ratio of inactives to actives. Now some active LDS might take that as a badge of honor and a sign of great faith but the reality is just the opposite. Bottom line it is tough to “Mormonize” a recruit. This is especially so once they get into the “meat” that the LDS sect keeps in the fridge until later. LDS fool themselves into thinking that their “milk before meat” strategy is a winner when it’s really a loser. The real reason behind it is to keep the truth from a recruit because learning the truth would keep them from joining. Also the love bombing technique goes just so far as it’s not kept up after a period of time. Being special and the center of attention is flipped as total obedience and dedication to the cause is the new reality to the fresh faced recruit. 1. God the Father has a body of flesh and bones plus spirit; and the investigator’s church (and all “churches of the world”) teach a false concept of God. Now that would be pretty easy to investigate and refute but is a prospect told to study to find himself approved? No that’s the last thing the LDS sect wants a prospect to do. What the MM are trained to do is to get the prospect to feel something not to think, question, compare, contrast and then conclude whether or not the claims are true. And here’s another thing. The prospect is directed to read the BoM after praying for God to send them a confirming feeling as to the veracity of the book. Again, they aren’t told to do some background checking on the book to determine at the very least, if it’s a historically accurate (book). No, no, no that would not do. The whole deal is based on a feeling and that feeling is to make the prospect think that they have had a special spiritual experience that should not be questioned. The LDS missionaries will never be totally honest about the Mormon Church’s doctrines and history for one simple reason: They haven’t been taught about them. The Mormon Church spends months teaching the missionaries how to teach potential converts and answer their questions, but the Church does not – and will not – teach their own missionaries about the Church’s questionable history or conflicting doctrines. “The Mormon youth simply asked his white Sunday school teacher why the man’s Nigerian wife and her family would join a church that had barred blacks from being ordained to its all-male priesthood until 1978. Why, the student wanted to know, was the ban instituted in the first place? To answer the teen’s inquiry, Brian Dawson turned to the Utah-based faith’s own materials, including its groundbreaking 2013 essay, “Race and the Priesthood.” His research prompted an engaging discussion with his class of 12- to 14-year-olds. Will the LDS missionaries ever be truthful about their Church’s history and doctrines? Not likely, since the missionaries probably don’t know the truth. And even if they do know the truth they have certainly been forbidden to discuss it unless they want to be removed from their calling as was the unfortunate Mormon Sunday School teacher. So you’re telling us that the MM don’t even know some of the more “interesting” facts about Mormon doctrine and history? (insert “gasp”) How can that be? It can’t be that difficult to unearth the truth. I did a quick “What you should know before joining the Mormon Church” google search. Within about five seconds I had a long list of things to check out. Just for fun I clicked on the CARM site and extracted this regarding what Mormons believe. The true gospel was lost from the earth. Mormonism is its restoration (Mormon Doctrine, by Bruce R. McConkie, p. 635). They teach there was an apostasy, and the true church ceased to exist on earth. Now here’s the deal. The LDS church will charge that any site that questions the LDS church or Mormonism is @nti Mormon. It’s a good way of keeping people from factual information. Take the questions and look into the information that can be accessed from LDS sources. Like former LDS bishop Lee Baker says “I didn’t know what I didn’t know.”, “The information was hidden in plain sight.”, and “I didn’t know what questions to ask.” What prompted him to begin his investigation was a question from a young Christian man who asked if Joseph Smith had bragged that he had done more than Jesus? That one question started former bishop Baker to look for an answer which led to another question and then another and another. I was looking at a copy of the little booklet ” Enticing Words of Man’s Wisdom ” by Wesley Walters ( published many years ago by the Utah Christian Tract Society ) . This booklet goes through the specific sales techniques that Mormon Missionaries used in their manual ” The Uniform System for Teaching Families ” . Mr Walters mentions that in the eight hours of missionary lessons given to a non Mormon investigator at 84 different points in the presentation the Missionaries are told to ” testify” that what they are teaching the investigator is true . The Missionaries are encouraged to give a testimony when ” the Spirit ” moves them which proves the truth of what they teach etc . , and of course the quicker the Missionaries can encourage the investigator to trust in his/her feelings to likewise validate the claims of Mormonism the sooner baptism can be scheduled . Mormonism is not the answer , Jesus is . In case the LDS missionary doesn’t feel the inspiration to bear his/her testimony as frequently during the missionary lessons as Church leaders would prefer, Church leaders have thoughtfully inserted instructions into the lessons pointing out when the missionary should bear his/her testimony and on what subject. A couple of good topics are, (1) Why do people leave the LDS church and (2) What do those who do leave wished they had known before joining the LDS church.